The squash boast is, firstly, hit onto the side wall to go onto the front wall. 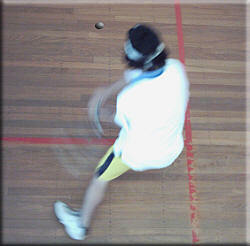 The squash boast is also an attacking shot to take an opponent to the front of the court. The execution of the squash boast is very similar to an angled drive. 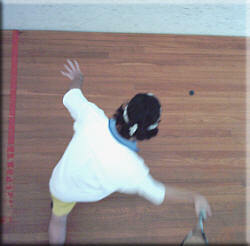 Angling off 3 walls can make the ball more tricky for opponent to recover (especially novice). Judging the angle to approach the ball is the tricky bit. It can be more deceptive than a three wall boast as it resembles a drive. To be practised after mastering the 3 wall type. Keep a racket length from the ball while moving to recover the ball. In this situation, the natural swing of the racket once the ball has gone past will take the ball into the side wall. Position your feet so that a line drawn from toe to toe on either foot is the direction the ball is to be hit. 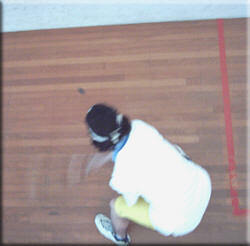 Alternatively, you can position yourself as you would a drive, but catch the ball later or deeper in the court. The diagrams in this link about angles will be helpful. Use the boast to make the opponent move around and increase the amount of running. The side walls and corners seem to put fear into the minds of inexperienced players. As players get to understand that the balls will rebound off the wall quite a long way, if enough time is taken, before recovering the ball. To wait for the ball it is important to keep away from the walls and corners to allow enough room for the ball to come out, and suffient room take a long stride, get low enough to take a full swing. By moving within an "inner" court area, say by not going closer to the side walls than the corner of the service box, it makes the court heaps smaller and therefore does not require so many steps to recover the balls. This inturn saves energy. Ghosting is one of the most successful ways of learning how to move around the court, and also examine all the known quantities, and realising what has to be done to recover the ball, and move back into position. Watch the ball at all times, particularly as it leaves the opponent's racket to get as many clues as possible to the height, speed and angle the ball will travel; this in turn will give some ideas on when to hit the ball, what pathway to take, how far the ball will rebound, and then knowing which is the most suitalble shot to play. Get quickly into a position parallel to the side wall, and any adjustment can be made in the footwork just prior to striking the ball. If it is necessary to wait for the ball (due to nearness to the walls), be sure to bend and get the racket head under the ball when swinging. Swing with the feet well balanced. The racket face is open to lift the ball onto the side wall. While the boast is produced in a similar way to a drive, there are a couple of important differences. The racket face should be kept more open to keep height on the ball once it has struck the side wall. (Less rotation of the forearm will ensure this happens). Instead of hitting the ball roughly in line with the font foot/shoulder, the impact point will be around or even behind the back foot. More advanced players can vary this. Ensure that you get down to the ball - usually by bending the knees - so that you get under the ball. Imparting backspin (open rracket face) will help sit the ball down lower on the front wall, and at the same time give lift to the ball. Be sure to swing through the ball (hitting upwards with the open face may cause the ball to go higher than expected). 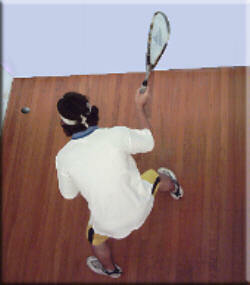 To lower the ball on the front wall, aim lower on the side wall (do not close the racket face). Stay away from the back wall and out of the corner. Angle towards back wall/side wall. Stay low and get under the ball. The biggest mistake many players make when trying to retrieve the ball from the back of the court, is to back themselves up against the back wall in an effort to get behind the ball. This can result in a missed shot, a cramped swing, a broken racket and perhaps all three! When attempting to return the ball from very deep in the court, stand with a wide open stance which positions you across and facing the back corner. Give yourself some room to ensure you can get as full a swing as possible - you may have to restrict the radius of the stroke at times. Swing through the ball into the side wall, swinging under the ball slightly, maintaining an open racket face. Getting out of the backhand corner can be dfficult, and often will leave you in the back corner in a defensive position. The volley boast is an ideal shot to bring the opponent forward enabling you to get to the T.
This shot can really speed up the game and put pressure onto the opponent, especially if they like to settle into a deep driving game. You will notice in this video how quickly the opponent has to move to cover the front corner to retrieve the ball. It is a pressure shot. The open racket face gives height on the side wall. The height on the side wall gets the ball above the "tin". The angle the ball strikes the side wall gives the angle onto the front wall. The boast from the mid court is usually a more attacking shot. Even novice players should try this shot as it produces a useful variation on the drive. The easiest way to hit this shot is to let the ball go slightly past you in comparison with the drive. Reducing the forearm rotation will also tend to send the ball in to the side wall. More advanced players can be quite deceptive with this shot as it can appear to look like a drive if executed properly.